My day: start with a time zone problem, then a flat tire, then 40 miles of mostly downhill riding to a place called Cliff Dwellers Resort for a good lunch, then cross the Colorado river at Marble Canyon, only to run into a bad storm., and ride back to Marble Canyon Lodge and bail out. It wasn't a bad day, but it was a short one. That means tomorrow will be another short day since, once I reach Page, it is 100 more miles to the next place to stop. 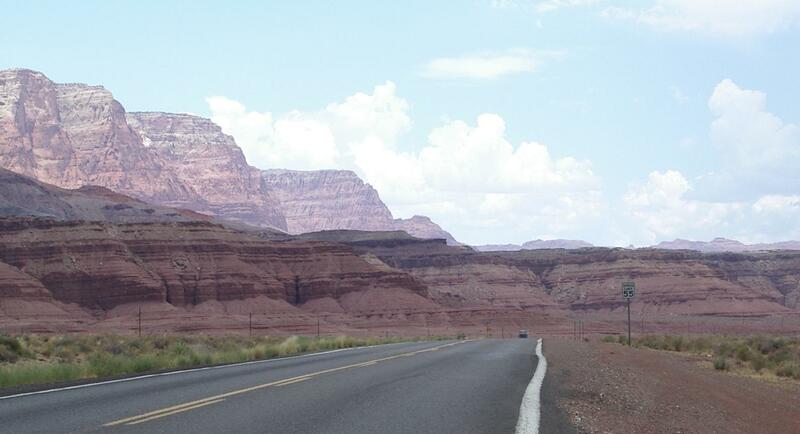 I'll ride in the morning tomorrow, hopefully avoiding the heat of the day on the climb out of the canyon, and I'll be well rested for the hard ride from Page to Kayenta. I woke up this morning before 7 AM, headed down to the restaurant for breakfast at 7, and found that they weren't open yet. They said they opened at 6:30. Another fellow who was staying at the Inn joined me in my frustration at the locked door. Oh well, I went back to my room, snacked a bit and worked on a web page. When I had finish that, about 8:30, I went back to the restaurant and had breakfast. When I finished breakfast, I noticed that the clock in the Inn said it was almost 8AM! Hmm, we must have no daylight saving time here! But where is here? After breakfast I worked some more on the web page, then repacked my stuff which had gotten spread out, and loaded my bike. It was after 9 (local time) when I rode out. I didn't get very far. When I started riding I thought "Gee, this loaded bike feels like it has a flat tire. It did. The rear tire was flat. I worked on the porch of my cabin - well it was mine till 11 AM <grin> . I found one puncture and one near puncture in the tube. I sanded both of them and applied glue. While I was waiting for the glue to dry, I inspected the tire. It had several rock chips embedded in the rubber, one of which had penetrated the cords. Although I might have still used it for commuting, it was worn out for touring. This was my first Schwalbe Marathon, and it lasted about 4000 miles on the rear. I've never had to replace Conti TT that soon nor have a I ever had one that was penetrated by rock chips. I patched the tube and put it and my Conti TT2000 spare on the bike. I have a second spare - a folding Pasela TG - so I don't need to worry about replacing the TT. After I fixed the flat, I reloaded my bike and headed out on 89A. I knew I had a big downhill since I was starting at 8000 feet this morning and would be at 3500 feet in 44 miles. Most of that altitude loss - down to 5500 feet - occurred in the first dozen miles as 89A wound its way down from the Plateau to a, relatively flat area at the bottom of the Vermillion Cliffs. 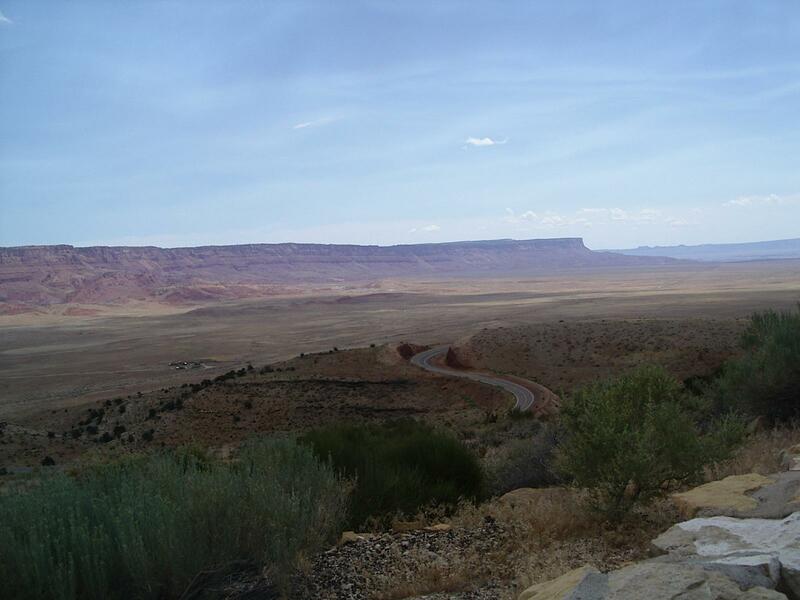 Most of the remaining 2000 feet is gradually lost over the next 40 miles, with the last few hundred feet lost on a steeper descent into Marble Canyon. I rode this section under a cloud with thunder sounding behind me. It was chilly so I wore my windjacket, liner gloves and windblocker socks. I had to cover my camera to keep the lens filter free of raindrops, and I could only take pictures when I stopped, because the road was so rough. The first part of the ride carried some extra spice because of the recent tire change. I always feel a little insecure on high speed descents right after a tire repair and the memory of my blowout in Eureka CA was still fresh in my mind. I had a couple of flat tires - one front blowout - on steep descents last spring, so I'm more aware of the problems a flat tire can present than I was last year! It is as bumpy as it looks! 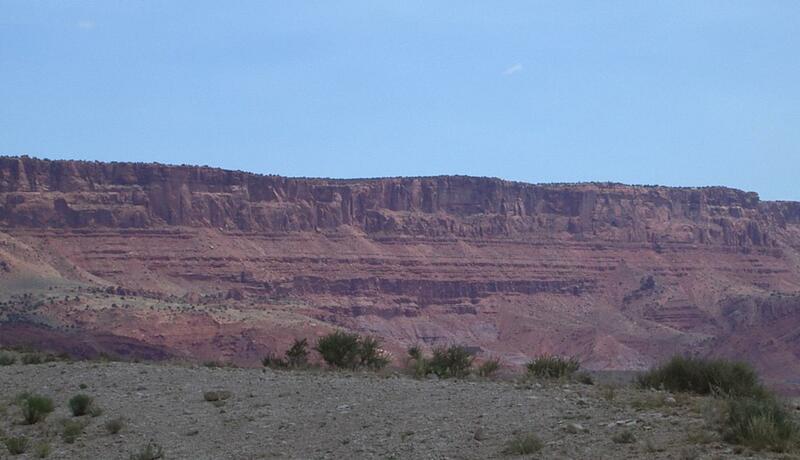 It was fast - 15 to 18 mph slowing down to 10 mph on hills - riding across the flat land beneath the Vermillion Cliffs. The cliffs were pretty, but the land beneath them was not. There were no shoulders, but traffic was light so that wasn't a problem. The problem was that a lot of the traffic was RVs. Many of them were rental RVs which I always worry about, but the only one that caused a problem this morning was a huge black - who would paint an RV black? - RV that passed me into an oncoming car. The car had to nearly come to a stop to let this jerk go by. I went over to the edge of the road and braked hard as soon as I realized he wasn't going to slow down. The cliffs 'got higher' as I got nearer the river. 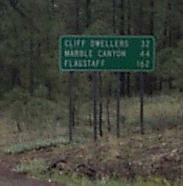 I stopped for lunch at a resort called Cliff Dwellers, located 9 miles before the river. 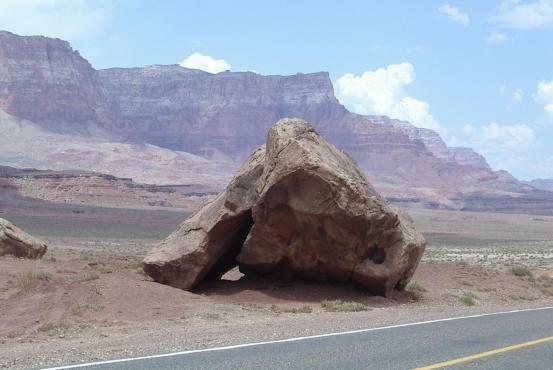 This resort is located after US 89A turns a corner around the point where the cliffs change direction. The cliff, which have been merely big cliffs, become unreal after that. My brain kept seeing them as some artist's creation rather than as part of nature. They are, like the Grand Canyon, way beyond what could possibly be real! As I neared Marble Canyon, the wind became very strong and I could see a big storm moving across the valley down river. 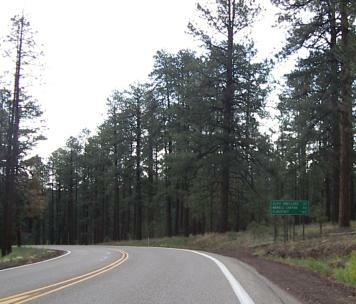 I had to fight to keep my bike on the road when 89A was heading north up the canyon. 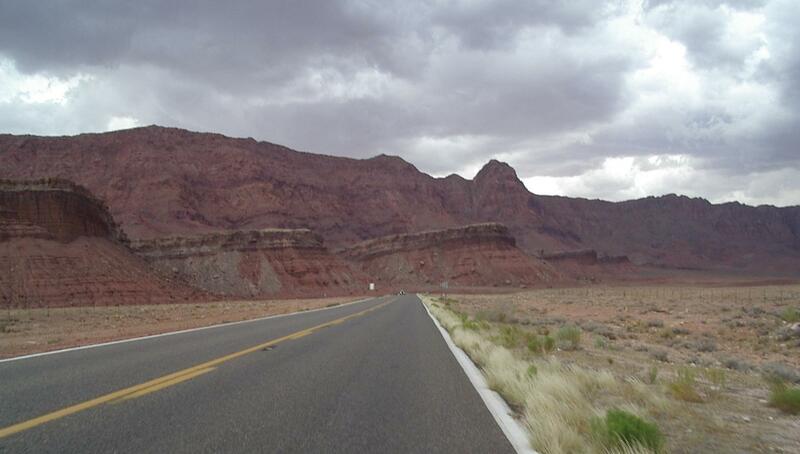 When it turned east to go down to Marble Canyon, The wind became a great tail wind. I rode through Marble Canyon - which is essentially a resort just down stream of Lee's Crossing - and across the Colorado River. I could see as I headed (with a good wind assist) uphill on the other side that 89A went over near the cliffs and then headed downriver, right into the storm. When I got the edge of the storm, I battened down the hatches - made sure all my panniers were water tight - and put on my rain gear. The wind was now a strong headwind and the rain drops stung when they hit me. I knew I was in for some hard riding, but I figured I could do it. Then a fellow driving the other way, stopped and opened his window to say "Be careful! It was raining so hard a few miles back that I couldn't see the road!" Now I'm riding on a shoulderless highway with lots of very oversized RVs, some of which are driven by jerks who will not slow down for much of anything. Should I risk riding into rain so hard that they can't see me? No. I turned around and was blown back to Marble Canyon Lodges by the wind.